We’re learning how to use our new Quad. We use Roku to watch tv. While going through and setting up various series recordings I came up with a couple questions. We’re using the web app through Safari on our iPads. If I’m viewing the live tv grid, and scroll sideways, it seems to only go out 24 hours. I’m still on my 30 trial so I thought I could scroll farther than that. Did I misunderstand something? After we’ve set something to record, we can see it in Scheduled, but is there something that delineates a series recording from a one-time recording? If my wife and I are both using the web app connected to our Tablo, are we each using a tuner? This question is in relation to just doing things like setting up recordings and/or looking through shows and learning the layout of the app. Not watching tv on our iPad. I told my wife that for now… make sure to disconnect from the Tablo before exiting the web app. Which brings up another question… if we’re watching something that is recorded… completely… recording completed… are we using a tuner if we watch it? We’re coming from using TiVo for a few years. A 4 tuner Bolt still has 4 tuners available if you’re watching something you previously recorded. So I’m trying to make sure I understand how the Tablo does this. We’ll probably have more questions as we get used to this, but right now it’s been a great experience. We still have the TiVos connected as we clear off the recordings, but we’re using the Tablo for our daily tv watching. Tablo hard wired. Living room Roku hard wired. Bedroom Roku is a streaming stick+ on 5Ghz wireless. House is wired for Gigabit network . Use the native iPad app not the Safari browser on your iPad. Live TV grid is only 24 hours. Guide data accessed through other menus such as TV Shows, Primetime, etc. is 14 days with a valid subscription. Thanks… I wondered why I saw 2 in the App Store. If my wife and I are both using the web app connected to our Tablo, are we each using a tuner? This question is in relation to just doing things like setting up recordings and/or looking through shows and learning the layout of the app. Not watching tv on our iPad. No. Only watching live TV uses a tuner. Recording uses a tuner of course. One will be iPhone and other iPad. No it doesn’t use a tuner if you’re watching a completed recording locally. If you watch it remotely this may use a tuner if you are transcoding the video to something lower than Full Quality. 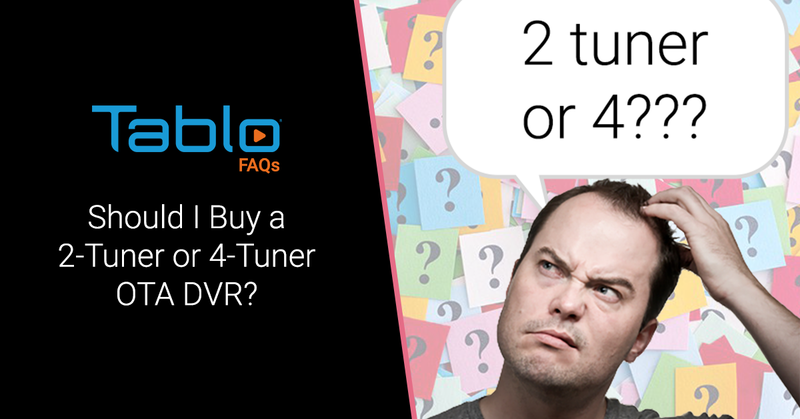 Should I Buy a 2-Tuner or 4-Tuner OTA DVR? Find out how many tuners you will need for the best OTA DVR experience. Thank you (all). I have to say this has been a pleasant and painless experience so far. High marks for wife approval (although she’s waiting for automatic commercial skip… the 10-second skip ahead isn’t really her favorite feature). She’s already cleared all recording off of one TiVo and is almost done watching everything on the other one. We’re using the Tablo Quad for everything unless she’s clearing something off the TiVo. We watch a lot of stuff on delay so it’s not done recording when we start watching. The first time she watched a completely recorded program she commented on how useful the tiles were for skipping through commercials. She likes it enough that she asked if we can get a second Roku remote (grins) for the living room. So far no issues. It hasn’t been a week yet, but we’re not seeing buffering or weirdness. Everything is hard wired except the bedroom Roku which is on 5GHz wireless.